Now The Legal Genealogist couldn’t look at those images without thinking, first and foremost, of the law that served as the foundation for the Civilian Conservation Corps, the CCC as it was known. The statute was “for the purpose of relieving the acute condition of widespread distress and unemployment now existing in the United States, and in order to provide for the restoration of the country’s depleted natural resources and the advancement of an orderly program of useful public works.”5 And hundreds of thousands of young men flocked to the program. Including one Billy Rex Cottrell. My mother’s oldest brother. We knew that Billy had been due to graduate from high school in Midland, Texas, where the family was living, in 1939.6 And we knew he’d joined the Navy in 1940.7 But he wasn’t living at home for the 1940 census.8 So where was he? Cool stuff, huh? And the sheer number of families who had someone in the CCC — to us as researchers today a brother, a cousin, father, uncle, grandfather — is staggering. So… how do we get the records? It isn’t critical that we have all that data — I got Uncle Bill’s records with his full name, date and place of birth, his Social Security number, parents’ names and hometown at the time of employment, and nothing more. But every bit of information we can supply will help identify the right person and get the right record. 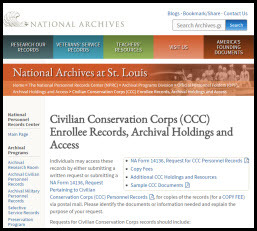 Then we send it in to the National Archives in St. Louis; the address and instructions for the form are online here. The National Archives will do a search and let us know if a record exists and how much it will cost — if it’s five pages or fewer, it’s a flat fee of $25; for six pages or more, it’s a flat fee of $70. We pay up, and the records are then sent by mail. So… have you ordered yours yet? This is great news! My dad served in the CCC in western Pennsylvania in 1935. He included several photos of his time in the camp in a scrapbook of his military service that I still have. I can’t wait to see what NARA has. My father didn’t serve in the CCC. I only have two uncles–girls ran in that generation. I know from cousins that both fathers were in the CCC here in Washington State, but they don’t know exactly when, where, or what they did. It was during the Depression (obviously). Both ran out of money for college tuition. Apparently they were in the CCC sporadically–when they earned enough, they went back to college, when funds ran out, they went back into the CCC. None of us have known how to confirm any of this. Thanks for telling me how to find out if the family stories are true! Hope the records are great for you, Doris! I am really glad to hear about this I’d wondered about my dad’s CCC service. I know approximately where he was, but not when. But it looks like I have enough information to go on. I’ve asked my brother to see if his SS# is on any of the papers he has, which should make it easy. Dad never talked much about the CCC. He was on a crew building a useless road (which apparently is true- I found some folks who remembered it) in the mts of Idaho. Lots of dissension in the mixed white and Native American crew. He stuck it out as long as he could and then went to the coast to work in the shipyards. I’d sure like to learn more about his experience with the CCC. My maternal grandfather, Stephen A Conlon, served in the CCC. He, too, is not listed at home in the 1940 census. We have a few pictures, and the family story is he worked on the stonework at the Quabbin Resevoir. I’m looking forward to checking out this resource. Thank you! I have no idea if any of my relatives were in the CCC. Where would I look to find out? Family records, newspaper articles, and census records are all possible places — along with asking the older members of the family what they might remember. Thanks for this information. I have printed the form and will fill out my Grandfather’s information. I have been told as we drove by a lot full of trees in Wise County, Texas that my grandfather helped plant them in the CCC. Hope I am able to find some information. Several years back I got my Dad’s CCC records. They were a wealth of information. He did two stints in two different camps. Along with the records came two certificates of service. I do not remember having to pay. Thank you for all your work. The CCC was a wonderful idea — one that we should consider reviving today. Most people probably have no idea how much of the infrastructure of our national parks and other conservation and construction projects that we are still enjoying today would never have existed, if not for this “make work” program. Likewise the “make work” programs of the WPA, which have provided us, as family historians, with so much written and photographic documentation of the lives of the ordinary people of our country during those difficult years. And much of the money folks earned while creating these treasures went to pay for food and other necessities for families all across the USA, circulating through local shops and sustaining local jobs that otherwise might have been lost. There’s no question but that our infrastructure is once again in need of some TLC and the struggles of middle America could certainly use a good hard look by a new generation of sympathetic artists and writers. Thank you so much for writing about this subject. It made me realize that NARA probably had personnel records for the WPA as well. And sure enough they do. The form to request information was only one number off from the CCC’s. To request the WPA Personnel Records, use NA Form 14137. I have already sent away for my Great Uncle’s information. to close at that time and the one at Harper after several months and we were all transferred to a camp high up in the mountains at Warm Lake Idaho. While at Harper I was made an assistant adviser and was given a six dollar a month raise. Once you know what camp(s) your relative served in…..Many CCC camps also published a camp newsletter. These varied widely in content and style, but in addition to articles about camp life and projects, many also included personal information about the enrollees.